Apparently a colour gradient (as I've just learned with a quick internet search), is a computer graphic term for a colour progression through a range of position dependent colours... or something like that. I loosely knew of the term and was enjoying a just post sunset walk with my nearly one year old son and was particularly taken with the way the sky seamlessly changed colours multiple times from the orange glow on the horizon silhouetted by the distant hills, to the deepening blue overhead interspersed with the first evening stars. And so an art lesson was born. 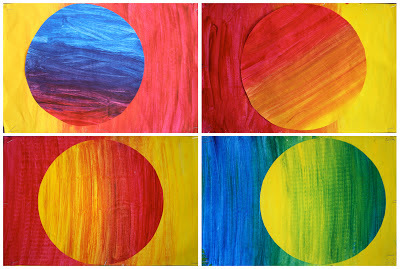 I'm calling them primary colour gradients, although I'm not sure whether they technically are or not... After some online image trawling I began by showing this stage three class some gradients on the smartboard including this Guillotine of Sunlight, Guillotine of Shade by Peter Wegner. 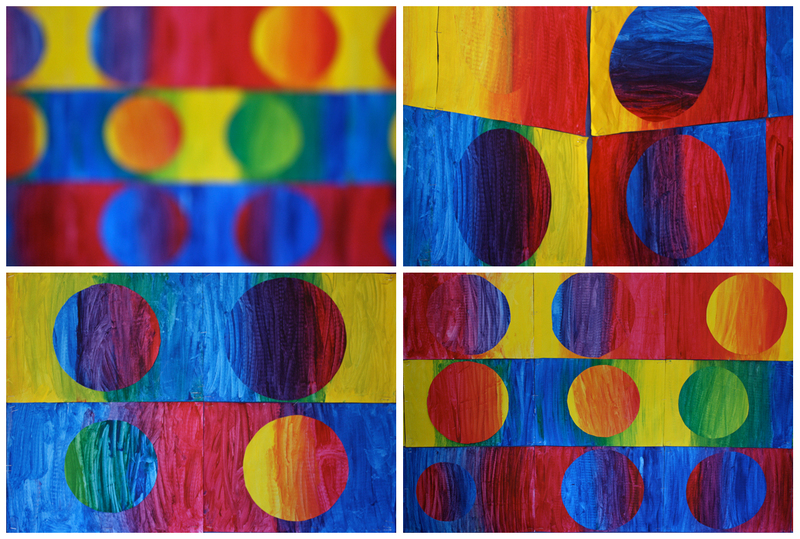 Like Wegner's piece, the gradients we created morph from one primary colour to another as they move through their secondary colour to meet. It's a little reminder and some useful practice at basic colour mixing and brush technique. 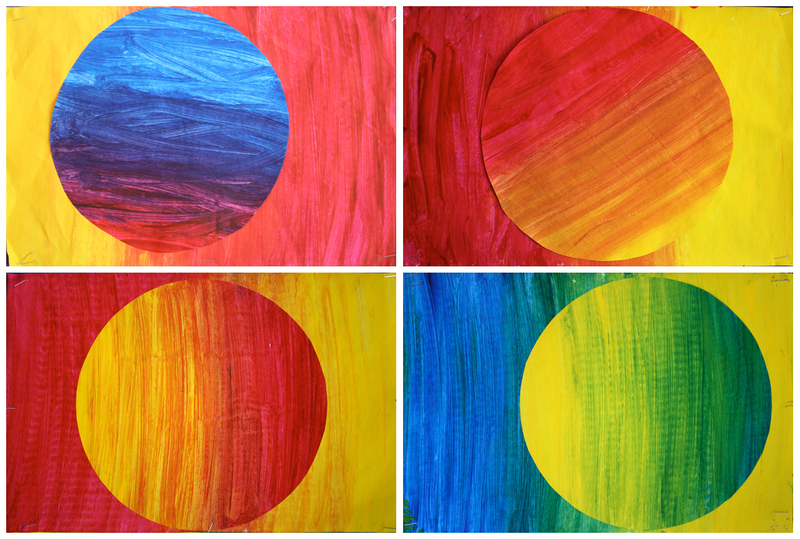 Each student covered two pieces of art paper in their chosen colours and once dry, cut a large circle out of one and stuck it somewhere and somehow on their other piece. Usually centered, often opposing but not always, with some in between. Most, but not all students, chose to use the same colour way on each sheet. The process was finalised over a few days with a great 5/6 composite class that I was with for 5 weeks at the beginning of this term. The whole class did really well and they were happy with the results themselves. As you can see the combined artworks made for a great display above the bag racks. 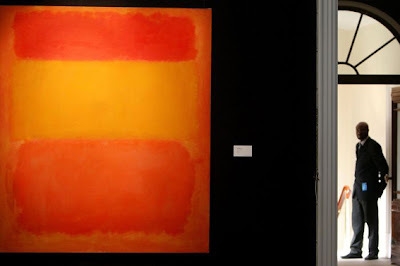 As a serendipitous aside, Mark Rothko's Orange, Red, Yellow became the world's most expensive contemporary art work after being sold at auction for $US86.9 million in the week following the creation of our own similar art. I showed the class his work on the smartboard and I think it really helped to validate the simple but effective nature of their own art works. The nearly $90 million certainly piqued their attention too! These art works are great, keep painting kids! These are super cool- simple but dramatic. What type of paint did they use for these? I'm also a huge Rothko fan. Thanks for sharing and good luck with the new art blog! 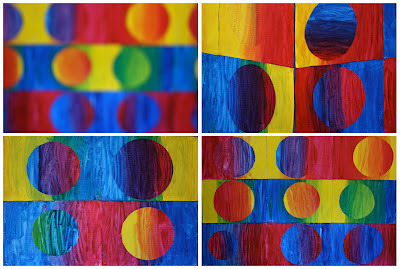 Nice color theory for this age - thanks for sharing! Wow! Very impressive color mixing with that grade level. They look very sophisticated. 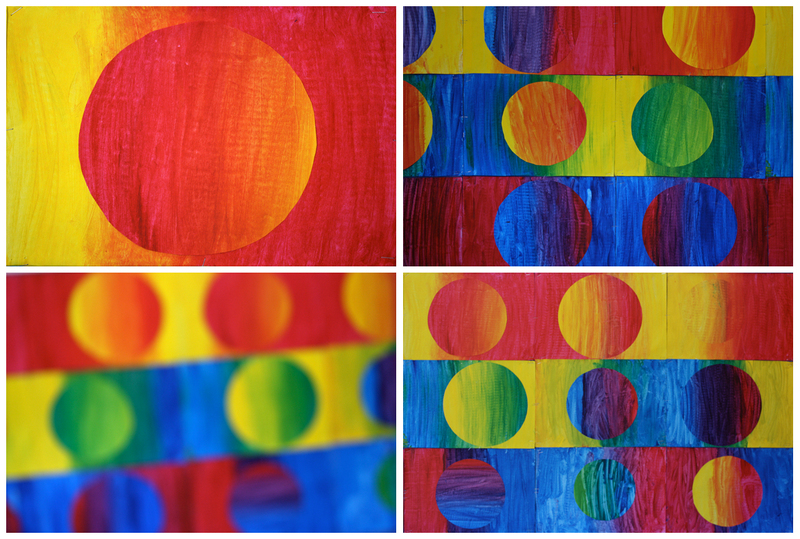 One surprise was how nice and round the circles were. My experience with children that young, is a bunch of misshaped blobs-nothing like your students perfect circles. Good on you, mate! I think year 5 & 6 in Australia means that this was done with 10-12 year olds. Correct me if I'm wrong?! Thanks Pat : ) The students used compasses to mark out their circles which helped a lot! 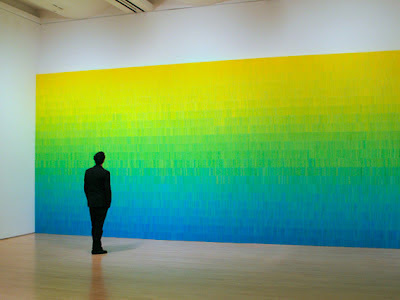 Thanks for the thorough research on gradients. I will be trying this idea out with a year 3 class next week. Creating art for a class each day doesn't always allow me time for this much research. Hopefully I'll have gradients on my blog by the end of next week. Thanks again. Thanks Gretchen, I really like the Don Binney inspired birds on your own blog. And I can imagine it would be very busy teaching art full time – but you're so lucky too! Going try this with my students in Cayman I think they will love the outcome thanks for posting ! 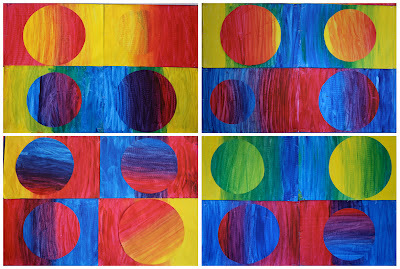 Did kids apply the primary colors on each side and work towards the middle? If you have other kid-friendly craft tutorials, we'd love for you to submit them. Thanks for a neat project idea!